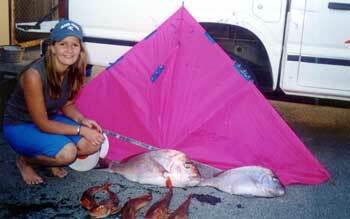 Hi Peggy, thought I would send in some photos of our kitefishing successes over the years for your newsletter. There's pics of Muriwai and Te Arai. We've been catching plenty of fish out west, mostly using squid, but there's been lots of sharks recently. Ed: Thanks so much for the pics Mike, they really came in handy this week as we're still not getting in any reports. Well done, and thanks again for your imput. Peg. 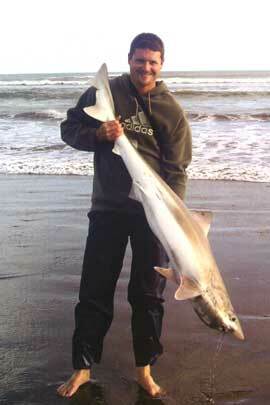 Above : A nice shot of a big Muriwai school shark taken in May. Ed : Taking good fish pictures is not easy. This pic contains all the elements a good fish photo should have, it's well framed, has a really interesting background, the fish is clean and looks like it is still alive, plus the main subject is off centre. Well done! It's a shame my scanner is a bit tired because the original photo looks so much better than the scanned image above. Pefection would have been not having the ute tray imposing on the scene and fewer footprints and tyre tracks in the sand. I think I will go to Te Ari point next October after seeing how well Mike and Natalie do at that time of year. 23rd March fishing with the kite, tide full, 1pm southwest wind. I put up the Nighthawk with Skyhook and it went out nearly straight. 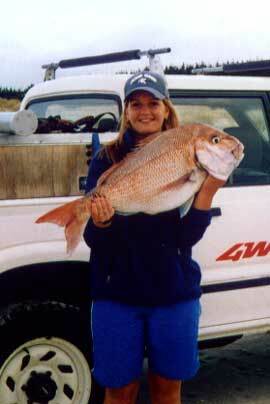 On the first set we got seven snapper three kahawai and three gurnard . The second set we caught two snapper and a kahawai. 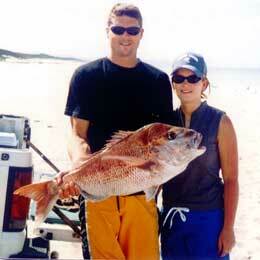 The biggest snapper weighed 2.5kg and the kahawai only had the head left. 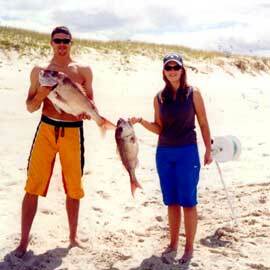 We used mullet, bonito and fresh kahawai for bait. We put the bonito baits in old tea bags before hooking them on instead of tying these soft baits on with cotton or bait elastic. Tea bags are much better! 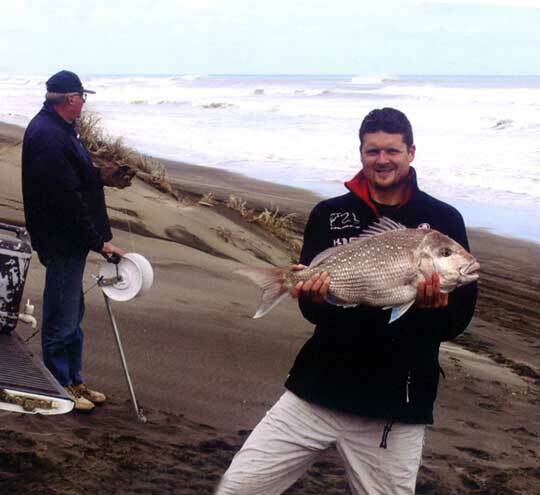 Sam Nadan fished Muriwai last Sunday, March 19th, in horrendous conditions. With winds gusting 35 to 45 knots and torrential rain, Sam launched his Nighthawk to set out his dropper rig fitted with 22 hooks baited with fresh mullet. Several attempts at launching and keeping the kite airborne saw Sam wet and wind blown as his girl friend sat snugly in the wagon sipping on wine. On the beach from 1:30 pm to 4:00 pm, and just one successful set to around 800 metres offshore, the kite was hit once again with a massive gust and wound up in the tide. Leaving it for just 15 minutes Sam decided to retrieve the gear. The winch groaned under the strain as Sam wound in 7 sharks, all about 1 metre in length except for one that had been bitten off just behind the head. 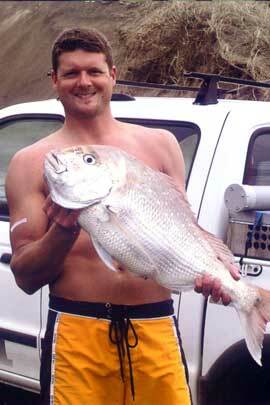 He also landed 9 snapper, 1 kahawai and one very big stingray. 18 big fish from 22 hooks set! No wonder the winch was moaning. Ed : Sam has a winch with one of our 200 watt motors and has a 40amp cutout switch. This is the first time it has ever tripped out. The total weight of fish on the line would have been over 100kgs. 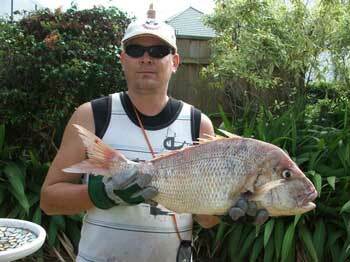 Above : Sams snapper catch. Picture taken with a cellphone. Holding the kayak in the water ready to jump on, I watched the smallest of swell I ever seen coming onto the beach - surprisingly felt the biggest undertow on the outward waves ever at my launch spot - jumped on and started to paddle to my imaginary lucky spot. On my way out I noticed another fisherman in a boat roughly where I have anchored in the past weeks, so decided to anchor up about 150 meter's north of him, about a kilometer off the beach. I drop anchor, bait up and start nibbling on a peach or two for break. 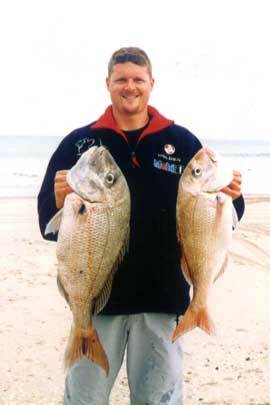 Not long after dropping the line, I was bringing up snapper, undersize, little ones. I released three, and baited a bigger piece of squid than I normally would (was just feeling a bit lazy and couldn't be bothered slicing the squid piece left over from the last cast in half). After dropping the baited hook, I lent back in my seat a little and waited for the familiar 'nibble, tug, tug tug'. I didn't get any indication of nibble this time. As I was admiring the view over Bean Rock, the flat water that looked like glass, my rod was almost wrenched from my loose grip and cracked onto the side of the kayak. I pulled up on my rod, it felt like I was snagged on a rock, as I pulled upwards, the yak started to tip over. I was struggling to keep from being dragged off the yak. I balanced myself by leaning over the opposite side of the boat. I was in a tug-o-war just to keep the rod in my grip and to stop the yak from going to far off balance ( I really thought I was going into the drink half a dozen times ). I had been towed around for about 20 minutes by now and was unable to haul the fish closer without risking capsizing the kayak. Eventually, I decided the best course of action was to tow the fish to where I could land it. I stuffed the rod into a scupper hole, with the clutch loose enough to run without the rod being tugged to hard. 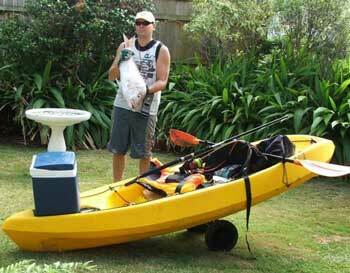 Yeah - this is good I thought as I unclipped my paddle from the paddle holders on the side of the yak. I turned the yak around and took note how far away the beach was. I remembered the fisherman 100 odd meters away from where I anchored, and glanced south to spot him. He was now about 200 meters away after my free ride. Well - he was alot closer than the beach so I started paddling towards him, slowly. The line was running out a lot, then stopped, then out again. I remember paddling for this guy and watching/hearing the line run. I will never forget that sight. It took maybe five minutes to reach this fisherman. He had his back to me as I approached his boat. That was a real neat feeling - made it - now what?!
" Hey mate - can you do me a favour" I asked. I'm sure I had a unusual urgency to my voice. "Yeah sure what can I do?" the boatie replies "Can you please take hold of my rod and reel this in, I'm having real trouble and have almost been tipped out a dozen times already trying to" He said"Oooookaayy" . I'm sure at this point this guy thought I was either mad, or he was on funniest home videos or something. I locked the rod clutch and handed the rod to him, and he immediately realised that something big was indeed hooked. "I think it's a ray - I'm going to get out of the way! I don't want a barb in me - chop the line if it is!" I said as I paddled backwards. "That's no ray!" he said as his face turned from inquisitive to what I can only describe as a 'fisherman's face' I watched with baited breath as he reeled this in. "That's a BIG fish" he said simultaneously as he swooped his net down and landed it on his boat. I paddled to the boat edge and was amazed to see this snapper that had given me so much grief for about half an hour that he had reeled in with what seemed such precision and grace. I thought to myself at that moment. "I need a bigger boat"
After the catch - we introduced ourselves. I anchored up beside him and we chatted and fished for about an hour. My saviour is Len, a local fisherman whom without hesitation, helped out a random kayaker who literally out of the blue sneaked up on him in the middle of the harbour in the early hours of the morning asking if he could please take my fishing rod and "wind this thing in as I'm having real difficulty not capsizing"
That's team work from two guys who didn't even know each other from a bar of soap. 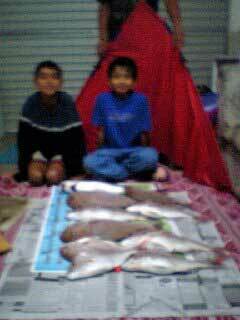 Needless to say, my parents who were arranged to come look after our cat/house for the night had a feast of massive snapper steaks for tea, breakfast and lunch the next day. Thanks again for the great product, was a lot of fun getting this snapper. I'll be back down to your shop soon to look at getting a net and a gaff! Authorities in the Pakistani city of Lahore have banned kite flying after strings laced with glass powder killed seven people, including two children, ahead of an annual festival. The ban was announced late on Thursday three days after a stray string - covered with a glass powder paste - slit the throat of a four-year-old boy as he passed through an upscale neighbourhood on his father's motorcycle. Some kite fliers reinforce their strings with wire or ground glass so that they can duel against other kites. When strings cross in the congested sky, the winner cuts loose the opponent's kite. The bleeding boy, Shayan Ahmad, collapsed and died in the lap of his father before he could be taken to hospital. The tragedy brought the death toll from such incidents to seven in the past two weeks. Above : The sport of kite flying has turned deadly and resulted in seven deaths. 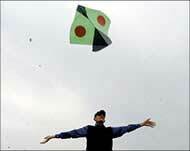 Politicians and human rights activists had been calling for a ban on a kite-flying festival planned for Sunday. The provincial government in Lahore announced on Thursday night that the ban on kite-flying was immediate and that violators would be arrested. Ahmad's father Mohammed Rizwan welcomed the ban. "I saw my son dying helplessly," Rizwan said. "My son's death has ruined my life." The festival, Basant, marks the arrival of spring, and during the two days of festivities the sky is covered with thousands of kites. However, the use of dangerous strings has turned the centuries-old pastime into a deadly sport. All seven people killed recently were riding on motorcycles, says the Lahore police chief, Khwaja Khalid Farooq. "We are doing our best to control the sale and manufacturing of glass and chemical coated strings." "We have arrested 1100 people since 5 March for selling or using prohibited material in the kite flying," he added. Ed : All kitefishers, especially those using spectra should keep your reel close to the water and stay near and be ready to act it if motorbikes, horses or cars are using the beach. There has been two non-fatal injuries in New Zealand with nylon kitelines. One involved a motorbike on Muriwai and the other a jetski at Orewa Beach.